The nose is the most prominent aesthetic structure of the face  in terms of its location and its cultural significance through the ages. It is the anatomical spearhead of the face and is hence, markedly vulnerable to trauma. It is also most commonly affected area by basal cell and squamous cell carcinoma in head and neck region. Reconstruction of partial or full-thickness defects of the nose is still one of the most challenging tasks for a plastic surgeon. The goals of reconstruction of nasal defects include (i) use of a similar type of tissue in terms of colour and texture, and (ii) an optimum donor site. Various local and distant flaps have been described for this purpose. The nasolabial skin is considered as the ideal donor site for nasal reconstruction because of its excellent colour and texture match and the possibility of camouflaging the scar in the nasolabial sulcus. The nasolabial flap is preferred method of nasal reconstruction  over other flaps due to its excellent blood supply, loose tissue and redundant skin, but the major drawback of this flap is the need for a two-stage procedure. The random pattern nasolabial flap is also bulky and limited in its reach. The nasolabial perforator flap is a well-known, versatile and highly recommended flap for nasal reconstruction. The most important advantage is the single stage procedure. Furthermore, the sensitivity, freedom of designing, minimal restriction of movement, extended reach and reliable venous drainage makes it score over others. This study aims to evaluate the utility of the nasolabial perforator flap in single-stage reconstruction of nasal defects. Study design: Retrospective and prospective observational study. Patients with a defect either of a part of the nose due to trauma or surgical excision of a lesion, the defect not being suitable for primary closure and who have undergone reconstruction of the defect with a nasolabial perforator flap. Patients who underwent other concomitant procedures or any other method of reconstruction of nasal defects, patients with a large defect beyond the scope of this reconstructive method and patients with insufficient follow-up were excluded from this study. After obtaining approval from the hospital ethics committees, we retrospectively and prospectively analysed all the patients who underwent reconstruction of a nasal defect using a nasolabial perforator flap during our study. 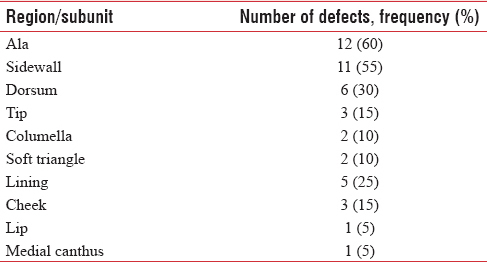 The prospectively collected clinical records and data of each patient was retrospectively retrieved and reviewed to study the nasal defect and surgery done based on the below-mentioned points. The pre- and post-operative photographic records were analysed. All the surgeries were performed under 4x loupe magnification. In cases of carcinoma, the skin lesions were excised with an adequate margin and histopathological confirmation of tumour free margins was done before proceeding with the reconstruction. A Doppler probe was used to identify the vessel in the nasolabial region when required. The defect was marked, measured and the flap size planned and the periphery of the flap infiltrated with 2% lidocaine with epinephrine 1:200,000. The incision and flap dissection was usually started from the medial side to look for the perforators. After identifying the perforator, flap was incised circumferentially, and the vein which usually lies laterally was identified. The sensory branches to the flap skin were preserved. For further gain in vessel length, perforators were freed from the surrounding tissue by further blunt dissection so that torsion and kinking may be avoided. The flap was then transposed, advanced or rotated to as much as 180° or tunnelled to insert into the defect. The donor defect was easily closed primarily in layers and the scar concealed in the nasolabial sulcus. No dressings were applied. All patients received a single dose of a broad spectrum antibiotic preoperatively and analgesics in the postoperatively for 3 days. The patients were discharged on the same day and followed up on the 2nd post-operative day for cleaning and examination and then on the 5th post-operative day for suture removal. Patients were then assessed after 1 month and further if required. At each visit the flap was examined and photographs were taken in the standard views and following data was recorded: (i) the cause and nature of the defect whether following trauma or surgical excision, (ii) the size of the defect and its location on the nose in relation to the nasal subunits, (iii) the operative findings and details including the number and location of the arterial perforators, veins and sensory branches if any, (iv) the main outcome was measured in terms of the flap survival and it was recorded as (a) full survival (when the entire flap was viable), (b) partial loss (<50% full thickness loss of flap) and (c) complete loss (>50% full thickness loss of flap) at the end of the follow-up period, (v) adverse events in the post-operative period if any (vi) flap stability and functional outcome of the reconstructed nose was recorded based on questionnaire and clinical photos, (vii) whether any revision procedures were done following the primary surgery, (viii) the final result was also labelled as good, fair or unsatisfactory depending on pleasing aesthetic outcome and (ix) photographic records were maintained in all patients after obtaining informed consent. Twenty patients with nasal defects were repaired with a nasolabial perforator flap with two patients (10%) underwent procedure bilaterally. Thus, a total of 22 nasolabial perforator flap procedures were carried out. The age of the patients ranged from 19 years to 78 years with a mean age of 50 years. The advanced age of most of the patients was attributed to a higher incidence of cutaneous malignancies that are common in this age group. Of these twenty patients, 14 (70%) were male and six (30%) were female. The patients were followed up for 2 months to 4 years with a mean follow a period of 15 months. 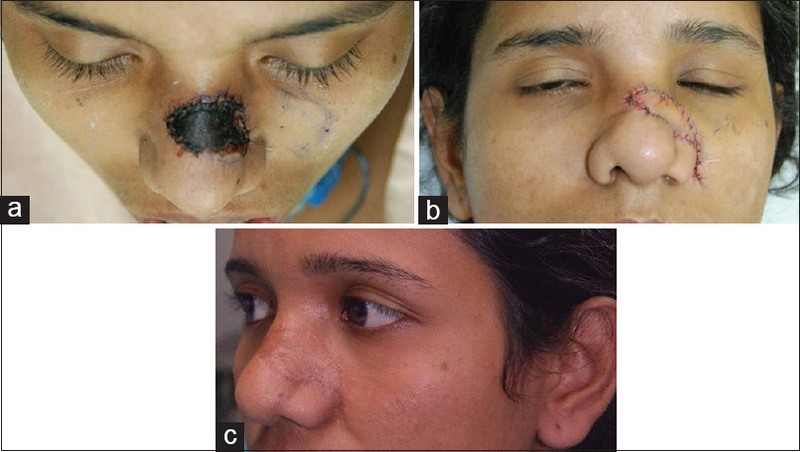 The cause of the nasal defect in ten (50%) patients was wide surgical excision of a malignant neoplasm (eight patients had basal cell carcinoma, and two patients had squamous cell carcinoma) [Figure 1]a,[Figure 1]b,[Figure 1]c,[Figure 1]d,[Figure 1]e,[Figure 1]f. The excised margins were all confirmed clear of malignant tissue by frozen section histopathology examination and all of these ten patients had primary reconstructive surgery. One patient with locally advanced basal cell carcinoma resulted in defect of almost the entire left half of the nose which required reconstruction with a nasolabial perforator flap for the lining and a forehead flap for the skin cover. Figure 1: (a) Basal cell carcinoma near medial canthus of eye. (b) Defect after wide local excision. (c) Dissection and identification of perforators. (d) Multiple perforators supplying flap. (e) Post-operative results after 1 week. (f) Post-operative results after 6 months. Five (25%) of the defects were post-traumatic. One patient had a large defect extending over the tip, ala, side wall and dorsum of nose required a forehead flap for skin cover and the nasolabial perforator flap was used for lining. Two patients needed replacement of the stenosed and scarred nasal lining. One patient required a single flap while the other needed bilateral nasolabial perforator flaps for replacement of the lining on both sides [Figure 2]a,[Figure 2]b,[Figure 2]c. Two (10%) patients presented with post-infective defects over the nose. One of these patients needed a single flap for reconstruction of the nasal lining on one side and the other patient with significant scar deformity and stenosis of multiple subunits and lining on both the sides of the nose required bilateral perforator flap to reconstruct the complex defect extending onto the cheek on the right side and across the nasal sill onto the adjoining upper lip. Other causes of nasal defects were nevus in two (10%) patients and a benign tumour in one (5%) patient. 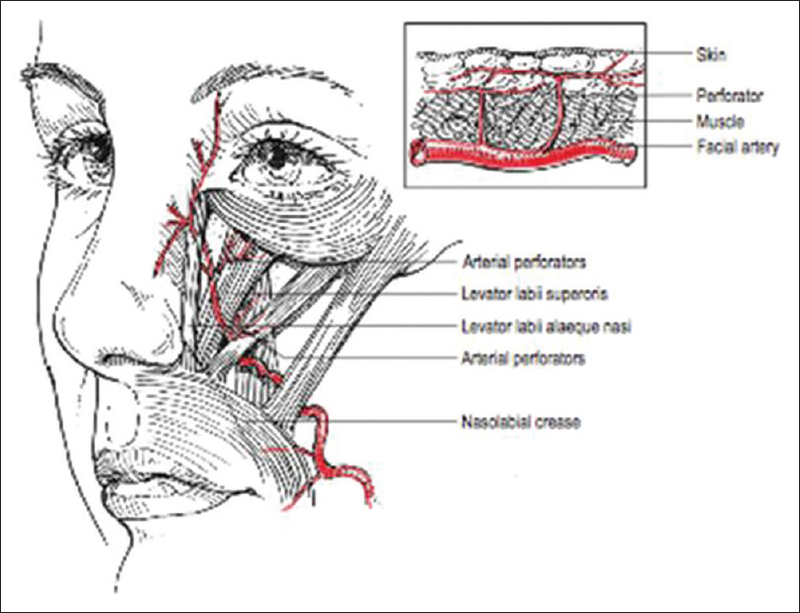 Figure 2: (a) Post-traumatic necrosis of skin over dorsum of nose. (b) Post-operative results after 1 week. (c) Results after 6 months. Single subunit was involved in eight (40%) patients whereas 12 (60%) patients had involvement of more than one nasal subunit [Table 1] and [Table 2]. Besides the nasal subunits, the nasal lining was involved in five (25%) patients, out of which two (10%) patients had only the lining involved and three (15%) had associated skin defects as well. In three (15%) patients, the defect extended onto the adjoining cheek and in one (5%) it extended onto the adjoining lip. One (5%) patient had involvement of the medial canthal region. In all patients, nasolabial perforator flaps were used for nasal reconstruction. No significant complications were seen in our experience. One (4.5%) patient had partial thickness necrosis of the distal 2 mm margin of the suture line. This patient was a chronic smoker who did not abstain from smoking in the perioperative period. However, no intervention was needed and the flap survived entirely with no loss. The scar and the appearance were also satisfactory at the end. Two (9%) out of 22 flaps raised showed distal venous congestion in the early post-operative period. In the first case, the flap raised was large and was advanced up to the medial canthus with excessive thinning of the distal part. In the second patient, post-infective scar extended on to the nasolabial region. Intraoperatively, the perforators found in this case were not of very good caliber, and fibrosis in the tissue planes was evident. Hence, the dissection was done carefully, preserving multiple perforators without skeletonising them completely and leaving a cuff of soft tissue around them. In both cases, the congestion resolved spontaneously without any intervention with full survival of the flap. All 22 (100%) flaps survived completely, and there were no incidences of partial or complete flap loss. The flaps healed well, and no revision procedure was required in the early post-operative period. All the twenty (100%) patients had good functional outcome. All patients with pre-operative nasal stenosis had a remarkable improvement in the patency of the nasal passages, breathing and nasal blockage with complete recovery of symptoms. The patients were entirely satisfied with the functional recovery. Out of twenty patients, 15 (75%) had good aesthetic outcome. They were completely satisfied with the post-operative appearance and cosmetic result achieved. Five (25%) patients had a fair result with the pleasing aesthetic outcome and no significant deformity. Out of these five, two (10%) patients, the flaps were bulkier than ideal. In another two (10%) patients, with large nasal defects, necessitated a forehead flap for skin cover, in addition to the nasolabial perforator flap which was basically used for the lining. In the fifth patient, there was bilateral deformity of the nasal lining and alar stenosis extending onto the adjoining upper lip requiring reconstruction with two nasolabial flaps, one from each side, also had fair result. Furthermore, no recurrence of tumour occurred in any of the ten patients during the minimum follow-up period. In all the patients, primary closure of the nasolabial donor site was achieved in a tension free manner. There was no incidence of donor site morbidity in the form of dehiscence, infection or hypertrophic scarring. With the normal in mind, the reconstructive surgeon must analyse the defect and determine what is missing, what is present, and what can be used to make what is wanted. Nasal defects, particularly, those created by surgery to eradicate locally invasive skin carcinoma, can leave the patient with a deformity of significant magnitude. The challenge for the reconstructive surgeon, in these cases, is to restore the patient's normal anatomy as accurately and naturally as possible with a minimum noticeable scar. Regardless of the causes of nasal deformity, the selection of reconstructive procedure is also closely related to the skill and artistry of the surgeon, that dictates the aesthetic and functional outcome of the reconstructive effort. Due to the critical function of the nose, nasal breathing must be maintained or in some cases improved during reconstruction. The basic principles of all nasal surgeries remain the same; know the normal, diagnose before you treat, make a plan, return normal to normal, rebuild in layers and use your brain and training. One should also consider the reconstructive principle of replacing like with like. The age, general health and aesthetic goals of the patient should also be considered in the decision-making process. Although the topographic nasal subunit principle of Burget and Menick is important in pre-operative analysis and planning the surgical reconstruction, other aesthetic considerations such as skin texture, colour and contour are also crucial. A balance must be achieved among all these factors and the patient's medical comorbidities, adjacent tissue availability, skin history and expectations. These multi-factorial problems can be addressed through various reconstructive options, ranging from primary closure, healing by secondary intention and skin grafting to the use of local or regional skin flaps. The decision as to which flap to be used is based on careful consideration of which tissue may be borrowed, how it can be repositioned, immediate and long-term effects of using that tissue, and how the scars can be hidden. The cited advantages are the close proximity of the fiap to the nose, the versatile design, ease of harvest, and a donor scar that can easily be hidden in the nasolabial crease. The other advantages, in addition to the robust vascularity, includes simplicity and time saving procedure. The proximity to the recipient defect, colour match and the satisfactory contour created from the relatively hairless areas utilised from the nasolabial fold are the other major advantages of the technique. Practically speaking, the traditional nasolabial flap has a limited role in nasal reconstruction because of various limitations:,, (i) It usually requires a second surgery to resect the pedicle to improve shape and aesthetics. Even when harvested as an island subcutaneous pedicle fiap, the arc of rotation and mobility are not sufficient to allow one-stage reconstruction, (ii) although a reliable flap, excessive thinning, undermining or tension may lead to necrosis and blood supply not reliably maintained if folded for cover and lining, (iii) the vascular supply of the fiap may not be robust, especially in smokers or in patients who have undergone previous radiation, and (iv) because of the limited excess available in the medial cheek, there is only enough nasolabial tissue to resurface a defect of about 2 cm in width, (v) it has limited arc of rotation and can be transposed to the ala, columella or to resurface the upper lip but it will not safely reach the tip or dorsum, (vi) the need to connect the donor and defect sites for inset of an islanded flap invariably distorts normal nasal anatomy and subunit relationships and donor site morbidity (dog ear) with distortion of the alar facial sulcus is likely because the flap must traverse this anatomic junction and is nearly impossible to completely correct once obliterated. The nasolabial region has an efficient collateral circulation  with abundant dermo-subdermal plexus which ensures good perfusion to the raised flaps. This plexus is supplied by a number of perforator branches from the chief vessels in the vicinity, namely, the angular or lateral nasal branch of the facial artery, the infraorbital artery or the transverse facial artery. 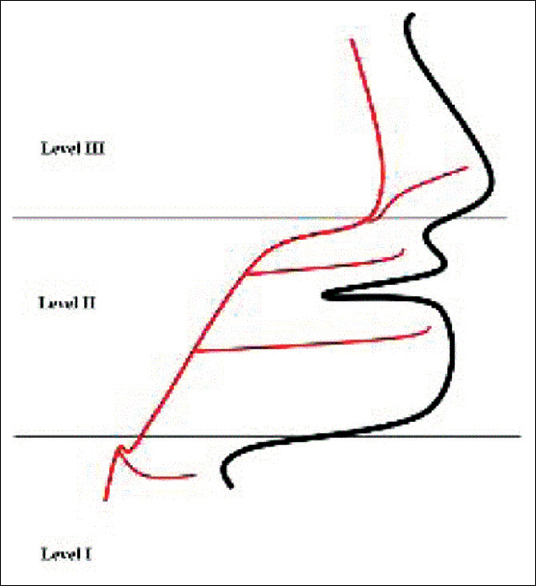 In general, perforators from the facial artery arise at 3 levels as described by Kannan and Mathur [Figure 3]. These are those below the jawline (level I) from the sub-mental artery or facial artery, between the jawline and the nasal alae (level II) from the inferior and superior labial arteries and superior to the nasal alae up to the glabella (level III) from the lateral nasal and angular arteries. The anatomical basis of this was provided by the study of the angiosomes of the facial region which showed that the facial arterial system supplied cutaneous territories in the mid face region. Mathes and Whetzel  defined a distinct pattern of vascularisation of the anterior face (facial and infraorbital arteries) as being supplied by small, densely populated musculocutaneous perforating vessels. Thus, the nasolabial region has been conclusively proved to be richly supplied with reliable perforators [Figure 4]. Figure 3: Levels of perforators. The venous drainage of the nose consists mainly of vessels anastomosing with the facial vein, either through veins traveling from the dorsum and lateral nasal wall, or through vessels accompanying the philtral and superior labial vessels. Level I fiaps have visible perforator complexes with both an infiowing artery and an outfiowing vein. With decreasing perforator complex sizes in levels II and III, this is not so obvious. The venae comitantes and peripedicle soft tissue of the perforating vessels contribute to venous outfiow. Venous drainage most commonly is from the fibrofatty tissue around the artery, similar to the situation in digital neurovascular island flaps. Given the density of the subdermal capillary network in the face, the intrinsic vascular resistance of these fiaps is minimal, allowing for the relatively smaller venae comitantes to suffice for outfiow. Perforator flaps have revolutionised reconstructive surgery and nowadays are often the first choice. The goal of reconstruction with a perforator-based pedicled flap is to achieve adequate functional and aesthetic reconstruction while minimising donor site morbidity. Perforator flaps have the advantages of sparing the source artery and underlying muscle and fascia. It combines the good blood supply of a musculocutaneous flap with the reduced donor-site morbidity of a skin flap. It allow for greater degrees of back-cutting into the base of the fiap for increased translational movement, without being concerned regarding its viability. There is reduced risk of venous congestion in the perforator group. Islanding of flap limits donor site morbidity and skilful skeletonisation of the perforator enables this flap to be rotated by 180° as a propeller flap with complete in setting possible in a single stage. One of the disadvantages of local perforator flaps is that they are raised within the zone of injury, which may leave part of the flap with compromised vascularity. Other disadvantages include meticulous dissection needed to isolate the perforator vessels (resulting in increased operative time, the variability in the position and size of the perforator vessels, and the ease of which the vessels can be damaged). The limitations of primary closure after flap harvest in the face limit the size and locations for pedicled perforator flaps. The only absolute contraindication is the absence of tissue redundancy in the nasolabial region. Relative contraindications to the use of this fiap include previous scarring, injury to the ipsilateral facial vessels, prior radiation, cocaine abuse, active smoking or collagen vascular disease. The patient must know ahead of time that a scar is permanent and takes many months to fully mature and that a line of demarcation at the junction of the transferred skin and the native nose will always be visible. The pre-operative discussion must be explicit, and it must never be assumed that the patient knows these concepts. Nevertheless, aesthetic results following a nasolabial perforator flap are better than the traditional flap with a much lower incidence of contour deformities or standing cone defects. Even in male patients, the flap rarely transfers hair-bearing skin, as the donor region is often the hair-free portion of the face. Revision surgeries are not routinely needed after a perforator flap reconstruction. After 6 months, with continued wound maturation revisions may be performed if necessary. The nasofacial sulcus or alar crease may be better defined by soft tissue excision or V–Y advancement. The nostril margin may be trimmed if too bulky. The most important skill in reconstructive surgery is assessing the defect, planning the reconstruction and choosing wisely from the ever increasing options available. The nasolabial flap, when raised on a perforator of the underlying vessel, is much more robust, can be tailor made for the defect, thus increasing freedom of reconstruction and aesthetically pleasing. The increased arc of rotation of the perforator flap greatly increases its reach, allowing it to be used for all regions of the nose, from the columella and tip, to the glabella and medial canthal region and optimum reconstruction of nasal defects can be achieved in the single stage. The reliable vascularity of the nasolabial perforator flap enables the elevation of a thinner flap to decrease the bulk and allow ideal contours, eliminating distortions of the neighbouring tissue and dog-ear deformities. The nasolabial region offers an ideal local donor tissue with good colour and texture match and similar actinic changes with the donor site successfully disguised in the fold. The reliability and versatility of the nasolabial perforator flap exceeds its recognised application in nasal defects reconstruction and must form a part of every plastic surgeon's armamentarium. Singh DJ, Bartlett SP. Aesthetic considerations in nasal reconstruction and the role of modified nasal subunits. Plast Reconstr Surg 2003;111:639-48. Wesser DR, Burt GB Jr. Nasolabial flap for losses of the nasal ala and columella. Case report. Plast Reconstr Surg 1969;44:300-2. Kopf AW. Computer analysis of 3531 basal-cell carcinomas of the skin. J Dermatol 1979;6:267-81. Karsidag S, Ozcan A, Sumer O, Ugurlu K. Single-stage ala nasi reconstruction: Lateral nasal artery perforator flap. J Craniofac Surg 2010;21:1887-9. Turan A, Kul Z, Türkaslan T, Ozyigit T, Ozsoy Z. Reconstruction of lower half defects of the nose with the lateral nasal artery pedicle nasolabial island flap. Plast Reconstr Surg 2007;119:1767-72. Gillies H, Millard DR. The Principles and Art of Plastic Surgery. Boston: Little, Brown; 1957. Lohuis PJ, Godefroy WP, Baker SR, Tasman AJ. Transposition flaps in nasal reconstruction. Facial Plast Surg Clin North Am 2011;19:85-106. El-Marakby HH. The versatile naso-labial flaps in facial reconstruction. J Egypt Natl Canc Inst 2005;17:245-50. Menick FJ. Nasal reconstruction. Plast Reconstr Surg 2010;125:138e-50e. Menick FJ. “Nasal reconstruction” head and neck. In: Neligan P, editor. Plastic Surgery. 3rd ed., Vol. 3. London, New York: Elsevier Publisher; 2013. Lazaridis N. Unilateral subcutaneous pedicled nasolabial island flap for anterior mouth floor reconstruction. J Oral Maxillofac Surg 2003;61:182-90. Hynes B, Boyd JB. The nasolabial flap. Axial or random? Arch Otolaryngol Head Neck Surg 1988;114:1389-91. Kannan RY, Mathur BS. Perforator flaps of the facial artery angiosome. J Plast Reconstr Aesthet Surg 2013;66:483-8. Houseman ND, Taylor GI, Pan WR. The angiosomes of the head and neck: Anatomic study and clinical applications. Plast Reconstr Surg 2000;105:2287-313. Whetzel TP, Mathes SJ. Arterial anatomy of the face: An analysis of vascular territories and perforating cutaneous vessels. Plast Reconstr Surg 1992;89:591-603. Timmons MJ. The deep venous system and reverse flow flaps. Br J Plast Surg 1994;47:290-1. Gilbert A, Brunelli F. Homodigital island advancement flap. In: Foucher G, editor. Fingertip and Nailed Injuries. Vol. 17. London: Churchill Livingstone; 1991. Kimura N. A microdissected thin tensor fasciae latae perforator flap. Plast Reconstr Surg 2002;109:69-77.